Gin has come a long way from Mother’s Ruin. However, access to finance can be a ruinous experience for a young gin distilling company trying to make its way in the world. Founded in 2013 by Mark Hensby and John O’Dowd, Liverpool Gin set out to provide “super premium organic gin” to a burgeoning market for quality spirits. The founders had considerable form in the drinks industry, with Mark being managing director of the Liverpool Organic Brewery and John the then owner/operator of the Belvedere Hotel in the city. They saw a chance to capitalise on the trend for boutique gins and distilleries. In early 2014, after extensive trials with focus groups, they arrived at a final recipe: what the company describes as “crystalline in appearance and luscious in body, [with] intense juniper and complex, well-balanced botanical flavour over a rich cereal note with a bright citrus finish”. The result of this research now sells between £45 and £55 a bottle, so a cut above your supermarket-own brand. Customers include Fortnum & Mason, Harvey Nichols and the Cunard Shipping Line. The distillery has more than 200 regular trade customers and a strong local market, plus an emerging international market. 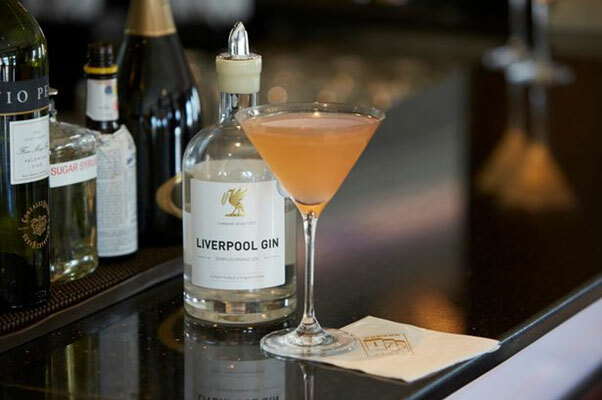 Though new, Liverpool Gin has already begun to garner accolades. The annual Global Spirit Masters competition, a blind tasting contest featuring entrants from around the world, awarded Liverpool Gin gold medals in both its Ultra Premium and Organic categories in 2014. The International Wine and Spirit Competition also rated Liverpool Gin as ‘Silver Outstanding’ in its contemporary gin category. Until now, business has been fairly low key: refining the product, sorting out branding and building the initial customer base. The owners have taken minimal remuneration out of the business, and it stands on a firm, if narrow, footing. Which is why they came to ThinCats – to broaden this out. Sterling put the loan agreement together: £150,000 repaid over five years. ThinCats’ individual lenders had the additional incentive of being able to join Ginocracy, LD’s online members club, giving access to special offers and priority tickets to Liverpool Gin events. The directors want to take the business to the next level, with investment split between product development and fixed assets, increasing output from 20,000 to 30,000 bottles a year. LD plans to expand its markets internationally, and also deepen them locally, taking on a salesperson to drive this. The 92 ThinCats lenders who are supporting this will drink to that. The auction’s finished. Your bid was successful and then … time creeps on. A few days later you can still be waiting for the investment to be drawn down and start earning interest. This is one of the main frustrations of ThinCats lenders. First of all, some hard info: the average time between the end of an auction and the disbursement of funds is slightly less than two weeks and can be as quick as five days. ThinCats averages about 23 days from the start of the auction – where the Sponsor determines its duration – to drawdown. According to our calculations, a well-known platform lending in a similar space takes more than two months to complete this process. This is more than a formality. Securing the loan may require the consent of prior charge holders. While they should respond to such a request for consent within two weeks, this can often take much longer. This issue is being addressed by the P2P Finance Association, which is taking up the significant delays being encountered by P2P lenders with the Department of Business, Innovation & Skills. Charges over property will also tend to add to the time taken, as searches regarding the title to the land with the the Land Registry need to be completed. Some of these processes can be started before the auction is concluded. Others cannot. As borrowers are responsible for legal fees, they may want to see the loan successfully filled before they start the process. The market cycle of fear and greed has turned resolutely to fear, if not dread. Financial pundits have been warning of impending market doom throughout the course of the year, a notable recent example being The Telegraph’s Ambrose Evans-Pritchard here. And with good reason. The year started with shares plunged on growth concerns in China, dragged further down by falling oil – despite the fact that rising oil also makes markets fall. While the equities have subsequently gained lost ground, no one really believes this is on what you might call terra firma. High-yield markets are suffering similarly, and gilts have only tickled the upper bounds of 3% on two (very) brief occasions since 2012, and now even 2% yield seems optimistic. Elsewhere, the property market looks frothy, and buy-to-let investors have had their returns eroded by measures announced in last year’s Budget. Commodities? Well, they just look unremittingly grim. As we celebrate the onset of spring, to many analysts it’s looking not so much ‘sell in May and go away’, as sell now and run for the hills. While economics is far from an exact science – the economist JK Galbraith once quipped it only exists to make astrology look respectable – negative sentiment is now the consensus and indicates a growing awareness of the instabilities that beset global markets. However one chooses to measure risk at the moment – whether in terms of volatility or chances of permanent loss to capital – there is little to comfort the investor. I am not going to take this opportunity to add my opinion to the growing pile of predictions for the economy over the coming year. Picking the closing figure for the FTSE100 on 31 December 2016 is about as reliable as trying to pick the winner of the Grand National before you even know who is running. However, in this environment it’s prudent to identify asset classes that exhibit stability of returns. If those returns are both stable and decent, then all the better. Peer-to-peer loans offer such a profile. Forgive me for ‘talking up my own book’, but the reason ThinCats’ founders set up this venture five years ago is because it seemed a potentially great asset class. Time has only strengthened that conviction. While the market is relatively new, it isn’t untested through the cycle. For instance, Zopa, the pioneer of P2P loans to individuals, was founded in 2005. Even in the depths of the crisis in 2008, it delivered positive returns across the platform. In comparison, the FTSE100 fell by more than 28%. Secured SME lending should, logically, fare better than unsecured consumer lending. UK business insolvencies were highest in 1992, peaking at 1.55-times their 10-year average, with about 2.5% of UK businesses going bust. Small business insolvencies peaked at a similar level in 2008. Despite the massive disruption caused by the crisis, the vast majority of companies continued to trade and – importantly – pay their creditors. If loans are secured, lenders can still make their money back from the claim over the underlying assets, should the firm cease trading. While small cap shares behave in a volatile manner during crisis – UK small cap equities fell by about 40% in 2008 – SME debt is much less volatile. I would argue that SME P2P loans enjoy an advantage relative to high-yield bonds, an obvious comparison with P2P SEM loans, as they are both forms of lending to non-blue chip companies. High-yield bonds are extensively traded, and as a result their value can and does fluctuate wildly. In contrast, most investors buy P2P loans at par and hold them to redemption, and so the portfolios display little volatility. Also, unlike ThinCats loans, bonds are not secured debt. While there is no way of telling what surprises lurk for investors this year, there are certainly ways of limiting the damage that can be done, without having to sacrificing returns. From April next year, interest from P2P loans may be paid without deduction of income tax, the Chancellor has announced. The move lists P2P loans alongside interest from unit trusts, Oeics and investment trusts, in what is a further move into the mainstream for the P2P asset class. In a parallel move, the government has finalised details on P2P bad debt relief. The new guidance, available in full here, sections 12050 and 12060) allows individuals with P2P loans that have become irrecoverable to claim tax relief on them. If any value is later recovered, then this recovery would then be taxed as additional interest received by the lender. The loans must be made by individuals through a regulated platform, such as ThinCats, and applies to loans that become unrecoverable after 6 April 2015. Alderburn Finance Solutions has joined ThinCats as a sponsor. The Edinburgh-based firm has a particular focus on Scotland, Northumberland and Cumbria, targeting a breadth of sectors and deal sizes. Alderburn has facilitated more than £4m of P2P loans over the past six months, including a £2.3m loan to a Scottish-based healthcare business, potentially the largest non-property P2P loan not just in the UK but world-wide at the time. The number of loans is still trending upwards, excepting a new-year blip. 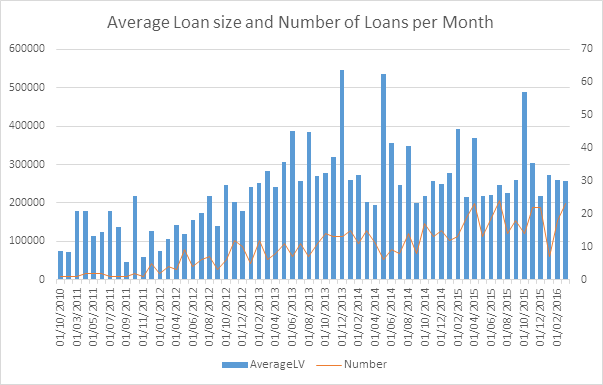 Average loan sizes are trending at between £250-300,000 – although except to see a jump when the LAMP deal feeds through into the April data.